If you are looking for information on the Cutters Point Coffee franchise business opportunity, Cutters Point Coffee franchises or Cutters Point Coffee franchising, then you have come to the right place. Cutters Point Coffee is committed to making a difference in communities one guest at a time. 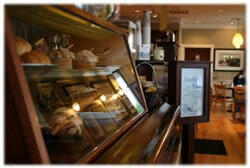 We do this by providing unmatched service and a premium cup of freshly roasted coffee in an inviting atmosphere. Cutters Point Coffee shops have quickly become relational hot spots in several communities across the nation. Joining our team by owning your own Cutters Point has proven to be a wise move into the rapidly growing industry of specialty coffee. It provides a platform for making a difference in your community while at the same time giving you a great opportunity to achieve financial freedom. Cutters Point walks you through every facet of owning your own coffee business. From choosing a great location to developing a strong team of baristas, we walk along side of you at every part of this great adventure. Not only do we have a track record of success but we also have developed an established brand name and trademark, local marketing programs, extensive training manuals and national purchasing power. Who is Cutters Point Coffee looking for when considering a Franchisee? Individuals who understand and believe in Cutters Point's mission of "making a difference in the lives of our guests". People who are committed to following a successful established business system. Individuals who meet the financial requirements to open a Cutters Point Coffee location. We are confident in our mission to make a difference in our community's one guest at a time. We are actively looking for motivated individuals like you to help us push our mission into more communities across the nation. We currently are offering both individual and multi-unit franchisees. We would also consider development agreements with qualified individuals.